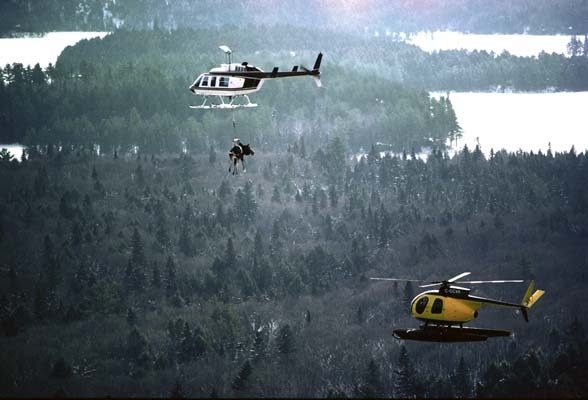 A moose dangling from a helicopter in Algonquin Provincial Park, Canada on its way to the base camp for relocation to the Wester Upper Peninsuala. Photo by David Kenyon, DNRE. After receiving feedback on the earlier moose posts (you can find the first one here and the second here) MNA was inspired to look up more information on the moose relocation that took place in the 1980s. A story on the lift was written in the March/April 1985 issue of the Michigan Natural Resources Magazine, a publication of the Michigan Department of Natural Resources. If you happened to be near Algonquin Provincial Park in Canada on a cold winter night way back in January of 1985 you might have seen something a little strange: a moose dangling under a helicopter. Over the course of two weeks, 29 moose were successfully located, captured, transported and released by the Michigan Department of Natural Resources and Canadian specialists. The moose were released in the Upper Peninsula in an effort to increase the existing population. Michigan Department of Natural Resources and the Environment photographer David Kenyon had only been working full time for the DNR for a year when he went on this assignment. The question that has to be answered though, is how do you transport 29 half-ton animals in the middle of winter all the way from Canada to Michigan’s Upper Peninsula? The answer involves a lot of maneuvering in the cold by a brave crew and some very capable helicopter pilots. Multiple helicopters were involved. The first was called the “chase helicopter.” It would locate a moose in an easy-to-access location, such as a frozen lake and Michigan DNR wildlife veterinarian Dr. Steve Schmitt would tranquilize the animal with a narcotic from the air. The first moose was found within eight minutes of the first flight out. A sling crew fastens a harness around a moose in Algonquin Park, Canada. The animals were groggy from a narcotic and difficult to maneuver. Photo by David Kenyon, DNRE. The next helicopter, known as the “lift helicopter,” would then arrive with the sling crew. The sling crew had one of the most difficult jobs – to fasten a harness around the moose. Three people had to arrange the groggy moose into a specially designed harness that would allow the helicopter to carry the animal back to the base camp. The crew worked in bitter cold temperatures and sometimes had to take off their gloves to move the harness into place. The helicopter had to hover a few feet from the ground so the crew could attach the harness to a cable. 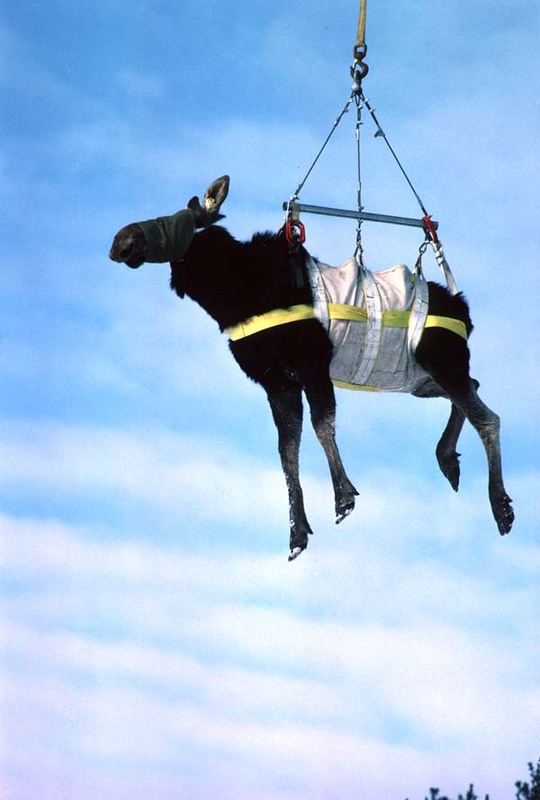 The moose were slowly lifted off the ice while the crew double-checked the harnesses. All of this had to be done while the helicopter whirled snow and ice around in a blinding wind. 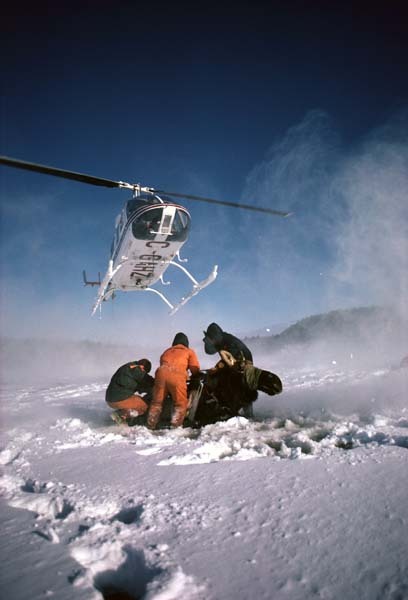 Some of the moose had to be flown as far as 14 miles to get back to the base camp. At base camp each moose was slowly lowered to the ground while another crew tucked the awkward animal’s limbs into a natural lounging position. With a complicated maneuver of the helicopter, the crew disconnected the harness from the machine. Before moving the animal into the transportation trucks, health checks were completed. The moose were checked for serious diseases and parasites. Their body temperature and tooth wear were also checked and measurements were taken. All the animals were fitted with a radio color to help the DNR track the movements in the future. After the moose were thoroughly examined, they were placed in specifically designed shipping crates that would carry the moose all the way to Michigan. The crates were hauled to each moose via a sled made of timber and rope and a mobile crane lifted each moose into the crate. The harness was removed from beneath the animals and they were given a drug to reverse the effect of the narcotic. After the drug was given, the crate’s top and doors were bolted into place. The crates were weighed and placed on a truck that drove to an isolated area to help keep the moose calm while more moose were tracked down. One day of working could result in four captured moose ready to make the trip to the U.P. The moose took a 600-mile truck ride to Michigan, travelling overnight to reduce the stress on the animals. Travel was often hindered by snowy conditions and sometimes took up to 24 hours. The trucks stopped every two hours to make sure the moose weren’t lying down for too long, causing circulatory nerve damage to their legs. The moose were released at a site north of Lake Michigamme in Marquette County. The crates were lifted out of the trucks and the moose and radio collars were checked. After a last health check, the moose were set free in their new home. The release site is near a few MNA Sanctuaries, including Braastad and Myrtle Justeson Memorial sanctuaries. Also nearby are Baraga Old Growth and Lightfoot Bay sanctuaries. One firefly, two firefly, green firefly, yellow firefly. That’s what Gary Parsons said happened about a decade ago in a study of Michigan firefly species. Parsons manages the A.J. Cook Arthropod Research Collection at Michigan State University. He said at one time, it was estimated the state held about 15 different firefly species, including flightless ones. Like Dr. Seuss portrayed fish in his fictional story, “some are fast, and some are slow. Some are high, and some are low.” Scientists started to notice differences between members lumped under the same species name in Michigan. “At some point, I would say it was about 10 years ago…we started getting these indications that these species were not just one species, that there were actually multiple species involved,” Parsons said. Parsons estimates there could now be 20 to 30 different species based on new classifications. An easy way for Michiganders to tell without a background in entomology and firefly behavior is to glance in their backyard, he said. “They don’t all flash with exactly the same pattern,” Parsons said. Michiganders can determine whether multiple species live in their backyard by differences in their behavior—some fly quickly into the air as they flash their bright light, others seem to float. Flashing patterns also help the fireflies distinguish between potential mates of their own species and those that are not. Parsons said the reaction that creates the light show of color in backyards across the state is created by enzymes when chemicals are combined. “They can mix these chemicals and it produces light very similar to the light sticks that you break and they start glowing,” Parsons said. The key to the reaction is luciferase, an enzyme. Luciferase speeds up a reaction between oxygen and the molecule luciferin. Luciferin releases energy in the form of light when it is combined with oxygen, producing the fireflies’ glow. Signaling and the frequency of flashes vary. 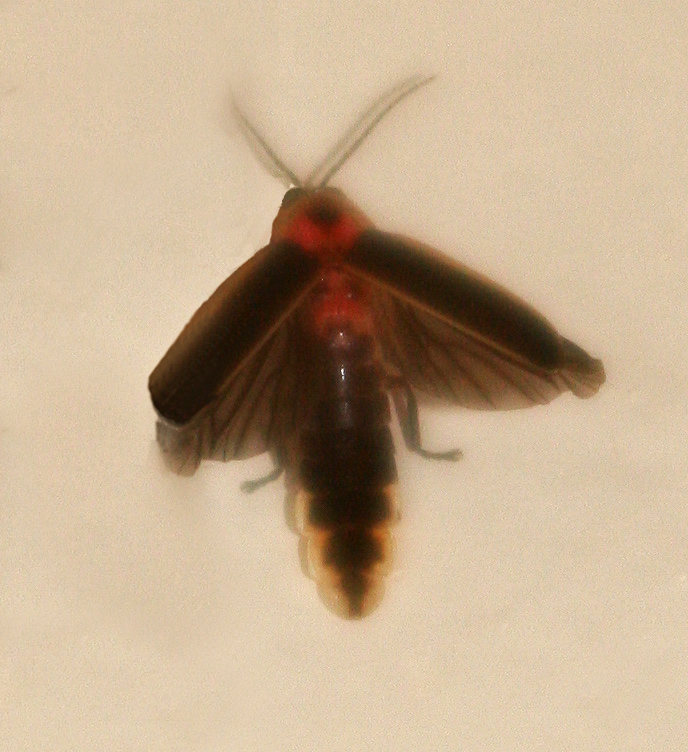 The way in which fireflies control their signaling is still unclear, but a 2008 study appearing in the Annual Review of Entomology suggested signals from the brain may trigger a series of steps that eventually allow oxygen into the cell chamber which houses luciferin, thereby allowing the bioluminescent reaction to take place and produce light. Parsons said there is no easy way to definitively tell fireflies apart—DNA analysis can tell, but that can take a long time after catching specimens and mailing them away. Visual cues can show there are different species, but identifying individual species as observed is difficult. Differences vary in the shade of light color, number of flashes per second and the intensity of the light flash. Parsons said the transitional area between woods and grassland is traditional firefly habitat, though they can also be found in open meadow. Michigan Nature Association has many sanctuaries with these habitat types. But these beetles, which carry the “fly” name, aren’t the only ones that can “light up a room.” According to scientific literature, click beetles and railroad worms glow using the same reaction as fireflies. Many other organisms, such as some marine animals, bioluminesce through other chemical reactions. I learned how to use an herbicide applicator and you can too! 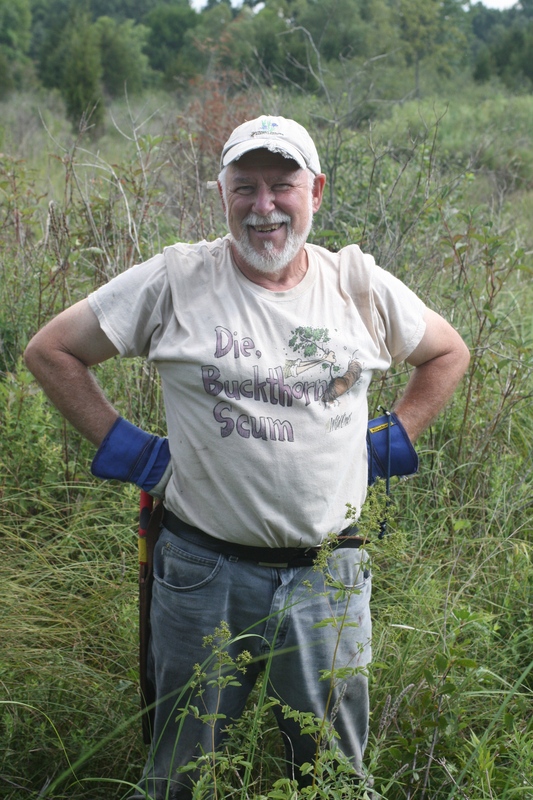 MNA volunteer Sam Febba proudly displays his "Die, Buckthorn Scum" T-shirt. Photo by Carolyn Sundquist. Our previous post about the Goose Creek Grasslands Sanctuary volunteer day talked about how we worked to eradicate glossy buckthorn from the property. Here you can learn how to identify and eradicate buckthorn on your own! 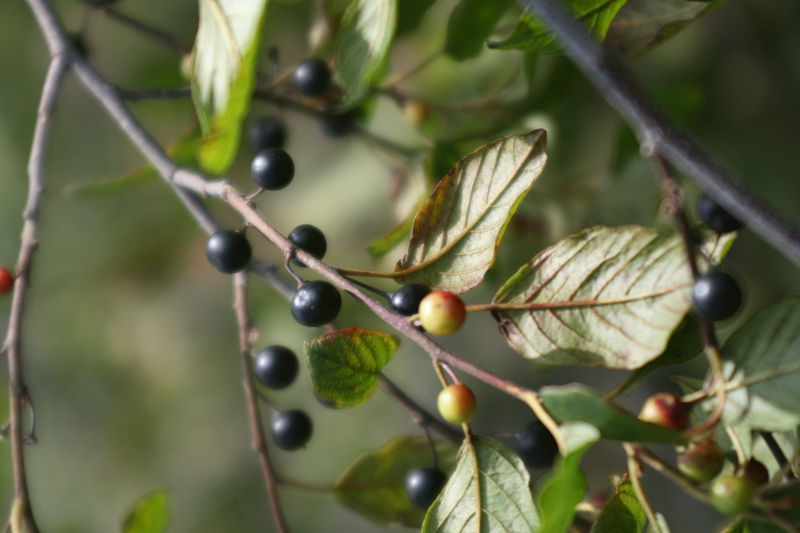 Glossy buckthorn was first introduced to the United States as an ornamental plant from Eurasia in the mid 1800’s. While it makes a nice living fence as it can grow up to 30ft, buckthorn is a very aggressive shrub and can become a pest in wetlands, especially fens. It is most common in Northeastern wet-mesic forests and in the Midwest part of the United States. It can be identified by its shiny upper part of its leaves which are dark green in color. Buckthorn produces pale yellow flowers that bloom in late spring and fruit that ripens in the summer. The berry color varies from red to dark purple and they are about the size of a pea. The plant is spread by birds who are attracted to the berries. Once in the ground, the seeds are viable in the soil for about seven to eight years. If we let the buckthorn grow in places like our Goose Creek Grasslands Sanctuary, they would multiply quickly and block out the light for the native seedlings and ground layer plants on the prairie fen. The berries and leaves of a glossy buckthorn plant. Photo by Carolyn Sundquist. There are many ways to eradicate the buckthorn, one being manually. This is not recommended however, because it causes soil disturbance. “This can cause other seeds in the seed bank to germinate and actually be counter-productive,” said Schultz. Another option when the plant is smaller than a pencil in diameter is hand swiping. This works when there isn’t enough surface area on the plant’s stem for concentrated herbicide to be effectively translocated to the plant’ roots. Volunteer John Reynolds uses a homemade herbicide applicator on the buckthorn. Photo by Carolyn Sundquist. “For hand swiping, you first put on a nitrile glove, then a cotton glove over it. You then dip your hand into the herbicide and directly touch the plant you want to kill with the cotton glove. This is slow, but a good way to be very specific in high quality areas,” Schultz said. When removing invasive plants, you always want to cause as little harm as you can to the native plants and animals. There are certain herbicides approved for wetland use that won’t cause harm to the amphibians in the area where they are used. These are the herbicides MNA uses for their applicators. “Herbicide is a last resort when we don’t have any other good options left,” Schultz said. Another option is using the foliar (leaf) backpack spray applicator, which uses the same type of herbicide as in hand swiping, but a much smaller concentration. Only 2 percent is used for the foliar application, but 35 percent is used for the cut-stump applicator. A cut-stump applicator is used once the shrub is cut down. It is fairly inexpensive and can be made right at your home! The cut-stump herbicide applicator was designed by Jack McGowan-Stinski, from the Michigan Chapter of The Nature Conservancy. Here is a link to McGowan-Stinski’s detailed instructions for making your own applicator. While most materials will be available at a hardware store, you can order the plastics from www.usplastic.com. You can also look for applicator-making workshops that happen all over the state by going to http://www.stewardshipnetwork.org! 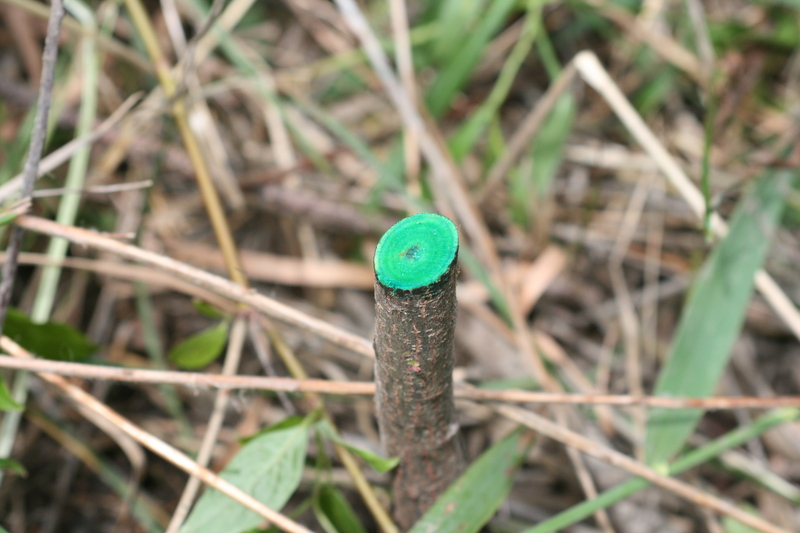 The stump of a buckthorn plant that was treated with herbicide. The green color allows us to know which plants have been treated already. Photo by Carolyn Sundquist. Always remember safety first when dealing with herbicides, so wear protective clothing! The MNA is committed to safely using herbicides and our staff has commercial pesticide applicator licenses from the Michigan Department of Agriculture. Our volunteers are considered to work under the MNA staff’s licenses. The next volunteer day at Goose Creek Grasslands will be August 9, 2010. 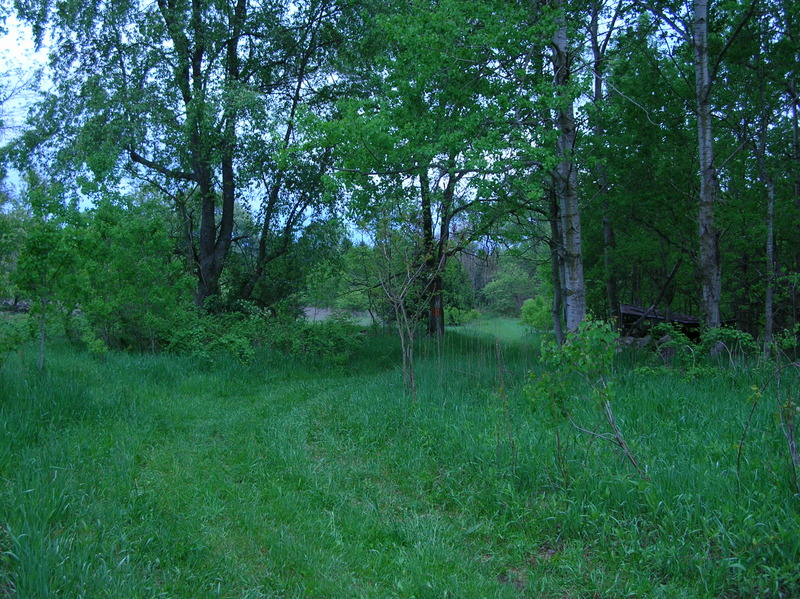 If you would like to participate in the removal of glossy buckthorn, contact Matt Schultz at 517-643-6864 to RSVP. Long-time MNA member, Bill Bliss, passed away in March 2010. 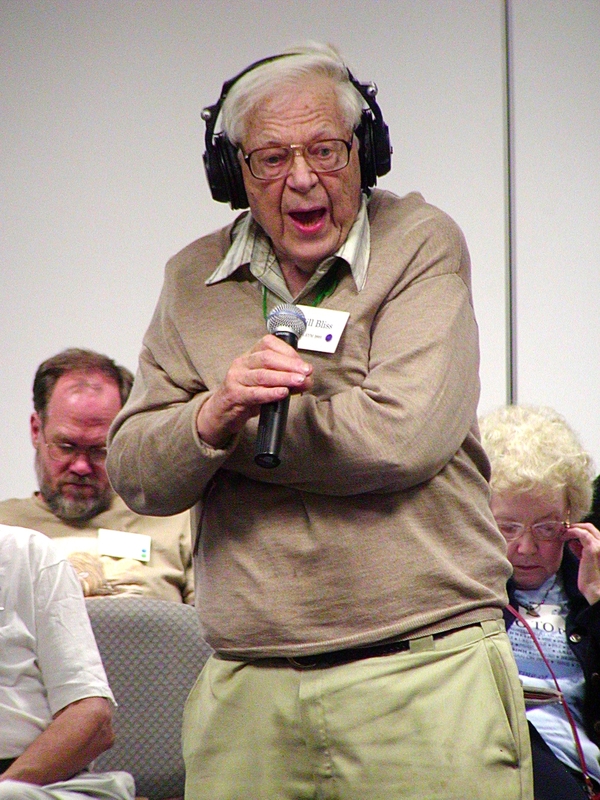 He was well-known for his passion for the environment and love for the Quaker movement. Long-time MNA member, Bill Bliss, passed away March 29, 2010 at the age of 93. Bill was most known at MNA for his Nature Notes column in the quarterly newsletter, where he focused on a particular species of plant or animal in each issue. The column was a way for Bill to share his passion for nature with readers and MNA will be continuing the column in his honor with guest writers. Despite his vast knowledge of the natural environment, Bill was not trained as a biologist. He received a degree in chemical engineering in 1940 from the Case Institute of technology and spent much of his career specializing in developing manufacturing processes that reduced chemical plant emissions. Bill was also an active Quaker and helped found the Quaker Earthcare Witness. Bill lived in the Cleveland area until he and his wife, Isabel, retired to Chelsea, Michigan in 1980. In Chelsea he lived next to a beautiful fen, where he took many nature photos that he sent MNA for use in the newsletter. 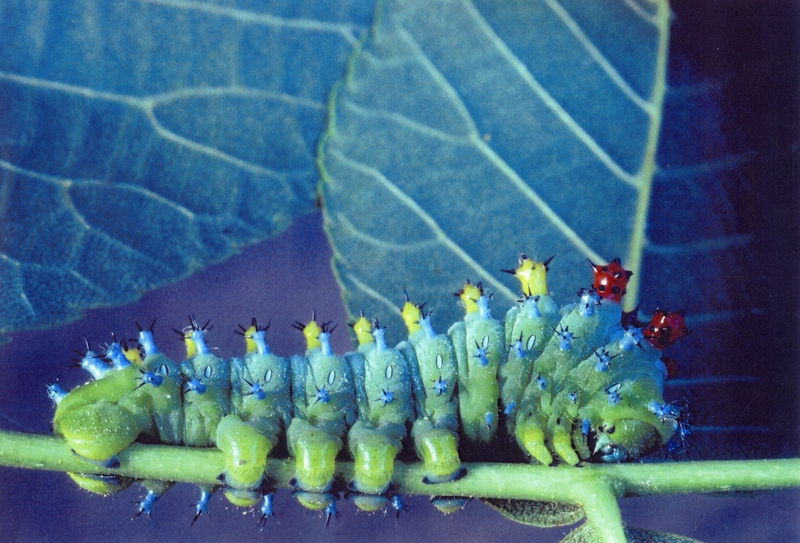 One of Bill’s most popular photos with MNA members was the cover photo of the July-September 2007 newsletter, a cecropia caterpillar. Bill was active in many different environmental organizations, including MNA, and the natural world will sorely miss such a strong advocate. Bill will also be greatly missed by MNA and many of its members. This photograph of a cecropia caterpiller was taken by Bill Bliss, a long time MNA member. It was his most famous photo and graced the cover of the July-September 2007 newsletter. Watching the wind flow through the tall grasses and listening to the birds sing, it is impossible not to let your worries be lifted away and an instant calmness overtake you when you enter Goose Creek Grasslands Sanctuary. The eight-person volunteer group piled out of our cars and into the beautiful, breezy morning on Monday, July 19. We were brought together by our desire to help protect MNA’s Goose Creek Grasslands. The volunteer day, hosted by Eastern Regional Stewardship Organizer, Matt Schultz, had our group working in the northern section of the property removing the invasive glossy buckthorn plant. Clippers in hand and knee-high boots on our feet, we began our walk to meet up with the other half of the group, who were lucky enough to kayak. They paddled in on Goose Creek, which runs throughout the property and provides an easy, but curvy route to where we were working. While the walk wasn’t as fast, it was just as enjoyable. We observed native plants such as the pitcher plant, which is carnivorous. Plants have been forced to adapt to the nutrient poor soil in this sanctuary. 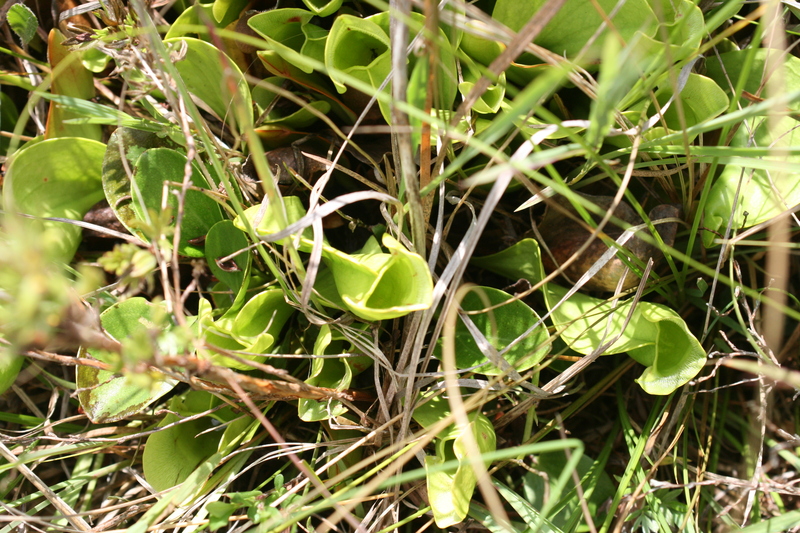 The pitcher plant, for example, traps curious insects in its pitcher-like leaves. The insect is then stuck at the bottom of the pitcher and digested for its nutrients. Matt also pointed out non-native plants, like the well-known purple loosestrife on the boundaries of the property. The ground was spongy under my boots as we hiked about half a mile to our destination. I blindly followed Matt through the knee-high terrain, as there wasn’t a direct trail leading us to our work spot. Once everyone was together again, they worked furiously to cut down the buckthorn bushes with clippers. Once cut down, the herbicide applicator was used on the remaining stumps to prevent re-growth. Look for the next entry to learn how to make an applicator of your own! 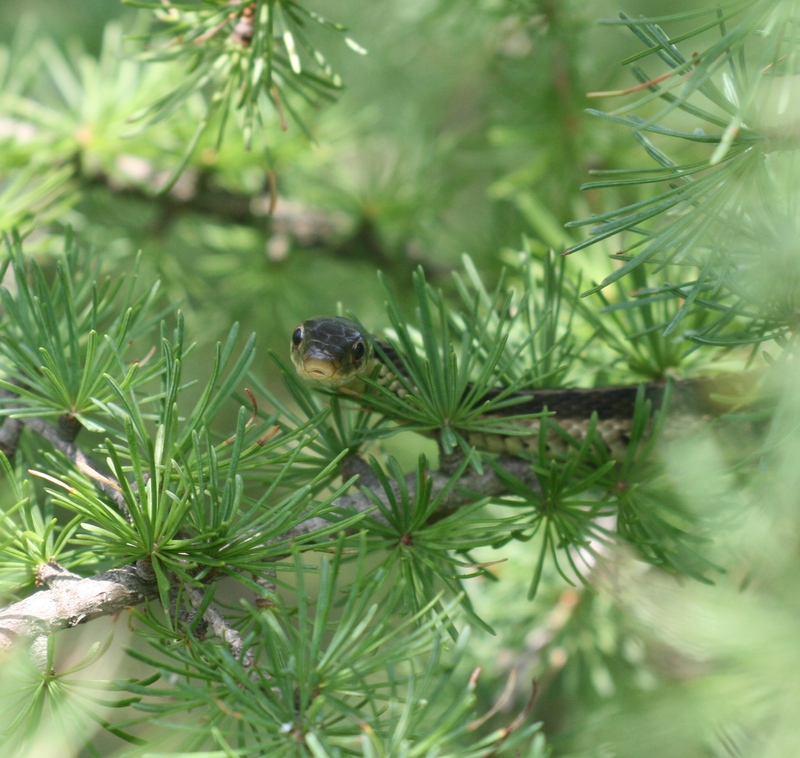 After a quick break for lunch, a spotting of a garter snake climbing a tree, and some more work on the buckthorn, we made our way back to the cars and said our goodbyes. While we didn’t take care of the entire glossy buckthorn problem at Goose Creek Grasslands Sanctuary, we did put a dent in it. 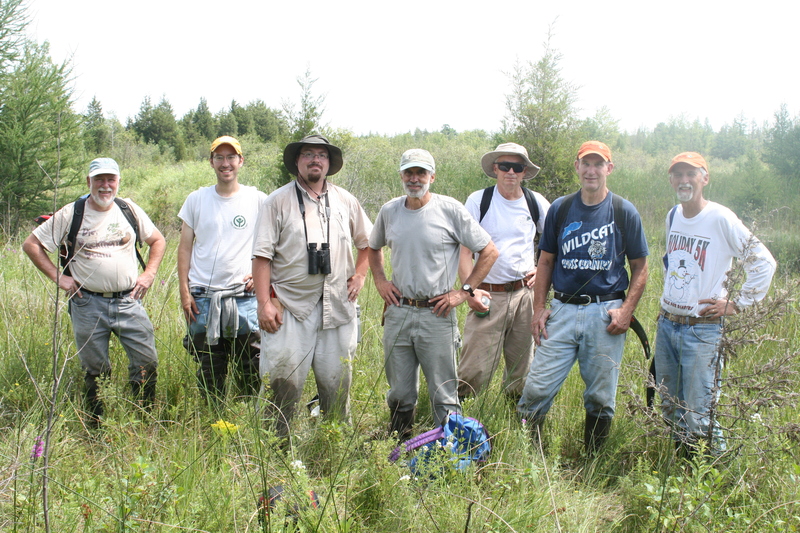 If everyone made a dent, we could keep the buckthorn from invading our rare prairie fen! Another volunteer day will be happening at Goose Creek Grasslands Sanctuary soon, so keep checking our event calendar! It’s not a huckleberry, and it’s not a blueberry. It’s Vaccinium cespitosum Michx., the dwarf bilberry. Compared with its relatives, the dwarf bilberry could be considered a dwarf—it tends to grow dense mats close to the ground. The bilberry plant does this by making clones of itself which are all attached either directly or indirectly, to the original parent plant. Some mats have reached sizes several meters in diameter. In Michigan, the dwarf bilberry was first discovered in 1980. Today, it only exists as a few individuals at nine sites located in four Michigan counties and Isle Royale. The bilberry prefers dry habitats with sandy soils in Michigan’s Upper Peninsula. The plant also resides in dry sand prairie mixed with dry northern forest accompanies by seasonal moisture that resembles meadow habitat. Despite its threatened status within the state, the dwarf bilberry also spans Canada and the northern part of the United States, specifically Wisconsin, Minnesota, New York, Vermont, New Hampshire and Maine. In addition, the bilberry has also migrated to Colorado, California and some southwestern states. The bilberry has small, light pink or white cups for flowers which bloom from late May to early July. The flowers are supported by green foliage with small leaves shaped like rounded fan blades. Bilberries are arranged on the plant in singles or pairs. Blueberries, in contrast, are found in a cluster and display larger leaves. Blueberries also exhibit a deep blue color while the skin of a bilberry is often almost black with a hint of blue. Fruit is visible from late June to August. Though members may miss seeing the bell-shaped flowers and dark fruit of this plant in September, they may view a threatened species of Michigan that has continued to remain part of the “family” when the Michigan Nature Association visits sanctuaries on its annual Fall Adventure to the Keweenaw. Don’t miss out on this and other adventures. Find out more about the Fall Adventure by visiting our Web page. A unique geological feature made copper mining an integral part of Michigan history in the Keweenaw Peninsula, and this area is also the destination for members attending MNA’s annual Fall Adventure. The Michigan copper mining boom of the 1800s is often told with photographs and stories. The Keweenaw Peninsula’s history is told with volcanic eruptions and faults. One billion years old, the peninsula holds a secret—one that Theodore Bornhorst says visitors can only see in a few, specific places. Bornhorst is a professor of economic and engineering geology as well as the A.E. Seaman Mineral Museum director at Michigan Technological University. A clay and broken rock mixture that appears near places like Douglass Houghton Falls and Hungarian Falls is like the spine of a book—it shows what may be there without revealing the full story. What the mixture isn’t telling is that it is a modern-day remnant of the inactive Keweenaw Fault. If not for this fault, the 6.6 million tons of refined copper produced by mines in the region between 1845 and 1968 would have never been. The Keweenaw Fault runs from the tip of the Keweenaw Peninsula to the Wisconsin border. “There has been no movement we know of on the Keweenaw Fault in the past 500 plus million years,” Bornhorst said. Bornhorst has studied various aspects of the fault for 36 years. But movement was the key to the fault’s formation. The Keweenaw Fault was formed by extension of the Mid-Continent Rift. This rift system begins in eastern Kansas, stretching 2,000 kilometers to the western part of Lake Superior before traveling down into Michigan in a southeastern direction. The rift system was formed by upward moving mantle. Mantle is the solid or partly melted material below the Earth’s surface. 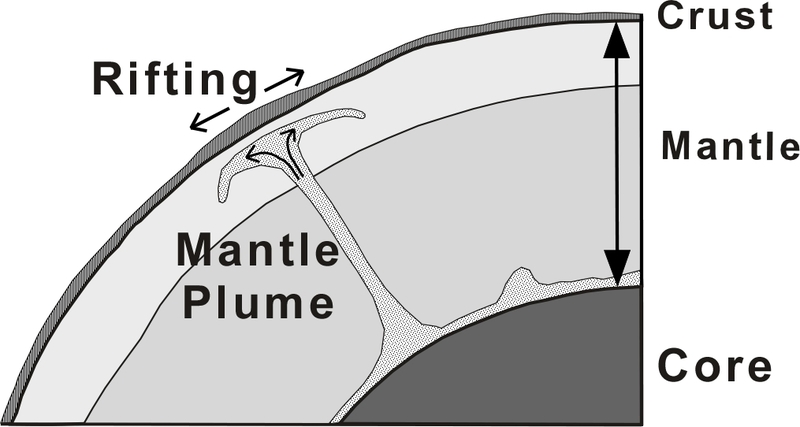 What Bornhorst described as a “mushrooming plume” created “normal faults” when the plume of mantle spread parallel to the crust and on the underside of it, creating a rift. The mantle created the rift when the crust was stretched and eventually torn apart to form a depression in the middle. “Imagine that you’re taking something that’s rigid and you’re pulling it apart,” Bornhorst said. A normal fault has one side of rock that moves upward, called the hanging wall. The other side moves downward and is called the footwall. Lava flows eventually formed eruptions on land, filling the rift and the Keweenaw Fault with volcanic rock. Streams brought additional layers of gravel, silts, sands and mud. But all was to change. Compression occurred 50 million years after the fault was created when a tectonic plate collided with North America. 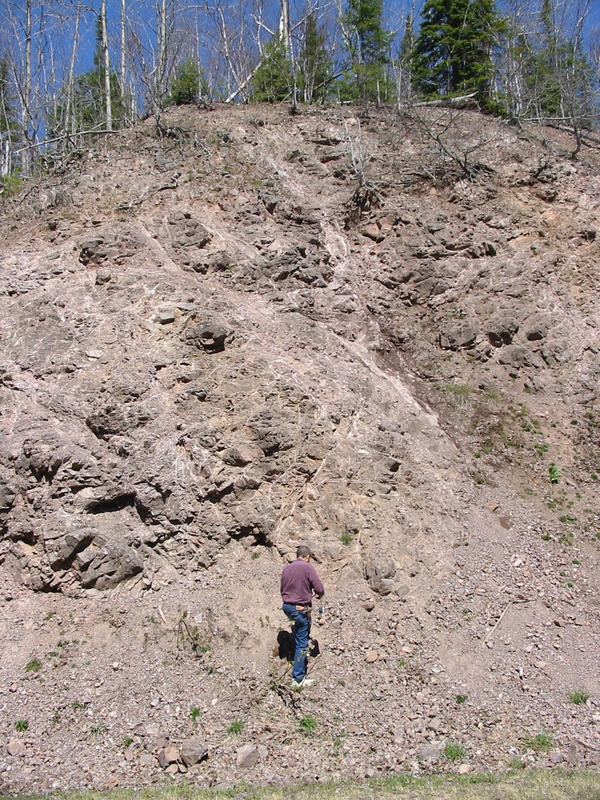 In a drastic change, the Keweenaw Fault became a reverse fault, in which the footwall slid lower than the hanging wall and volcanic rock from past eruptions and other minerals filling the middle were forced upwards. This created the Keweenaw Peninsula. But the event helped create something else. Bornhorst wrote in a paper that this event may have created the pathways—fractures, cracks and faults—that allowed copper-carrying fluids to rise. These fluids began as “hot, mineralizing waters” reaching temperatures of more than 437 degrees Fahrenheit. These waters eventually became ore fluids delivering native copper and other minerals to spaces in the rock filling the rift. “As they moved upward then they cooled down and had chemical reactions with the other rocks and mixed with other things to make the copper come out of solution,” Bornhorst said. The compression, which created more pathways, may have helped the fluids to rise by slowly leaving native copper deposits behind. “This specific situation has happened elsewhere in the world, but the bottom line is never to this extent,” Bornhorst said. He said a similar example is located in Quebec, where small amounts of native copper are found associated with the Gaspé Peninsula. 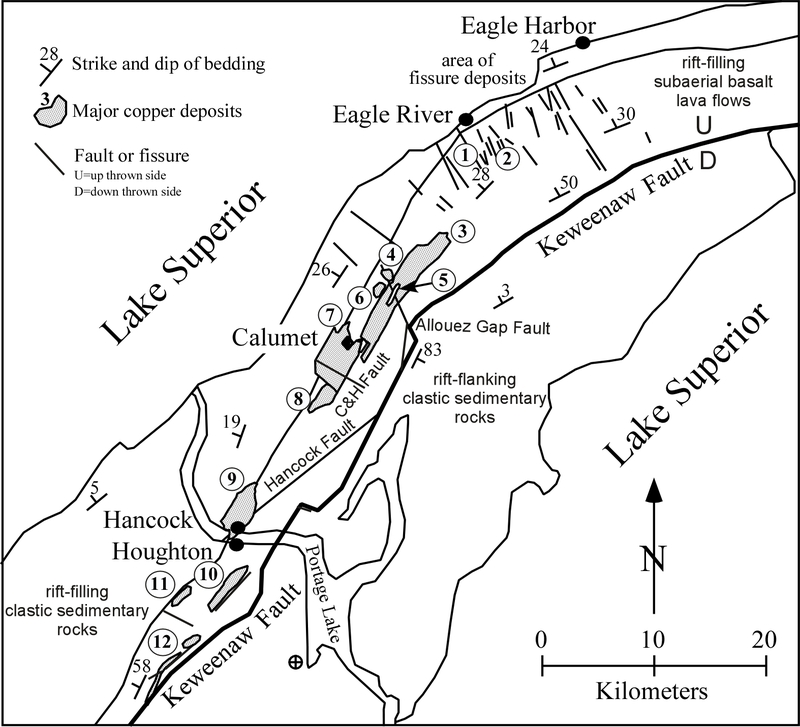 Despite the similarity, copper deposits formed near the Keweenaw Fault remain the largest. “We’ve never found any other place that has had this mass of mineable native copper,” Bornhorst said. That mass of mineable native copper remains the largest on Earth.